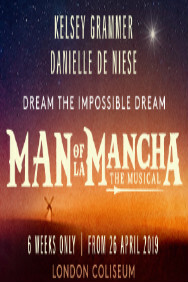 Man of La Mancha tickets at London Coliseum, London. 2019. Performers Kelsey Grammer (Miguel de Cervantes/Don Quixote), Danielle de Niese (Aldonza/Dulcinea - not appearing: May19 1/8/15/21/22/24/25/28/29/31 Jun19 1//3/5/7/8), Nicholas Lyndhurst (Innkeeper/Captain), Cassidy Janson (Aldonza/Duchess - sharing the role with Danielle de Niese), Peter Polycarpou (Sancho Panza), Eugene McCoy (Dr Carrasco/The Duke), Lucy St Louis (Antonia), Natasha Leaver (Fermina), Debra Michaels (Maria), Julie Jupp (Housekeeper), Minal Patel (Padre), Emanuel Alba (Barber), Rakesh Boury (Muleteer), Stephen John Davies (Muleteer), Paul F Monaghan (Muleteer), Ryan Pidgen (Muleteer), David Seadon-Young (Muleteer/Pedro), Samuel Thomas (Muleteer), Teddy Wills (Muleteer), Femi Akinfolarin (Muleteer), Tim Hodges (Ensemble), Luke Jackson (Ensemble), Dominic Owen (Ensemble), Joseph Poulson (Ensemble), Jocelyn Prah (Ensemble), Anna Woodside (Ensemble), Tash Holway (Swing), Helen Walsh (Swing), Luke McCall (Swing), Alex Pinder (Swing).. Author Dale Wasserman. Lyrics Joe Darian. Music Mitch Leigh. Presented by Michael Linnit. Presented by Michael Grade (in collaboration with English National Opera). Director Lonny Price. Conductor David White. Design James Noone. Lighting Rick Fisher. Sound Mick Potter. Director David Grindrod (CDG - casting director). Friday, 26th April 2019 to Saturday, 8th June 2019. Wed, 1 May at 7:30PM.Thu, 2 May at 7:30PM.Fri, 3 May at 7:30PM.Sat, 4 May at 7:30PM.Mon, 6 May at 7:30PM.Tue, 7 May at 7:30PM.Wed, 8 May at 7:30PM.Thu, 9 May at 7:30PM.Fri, 10 May at 7:30PM.Sat, 11 May at 7:30PM.Mon, 13 May at 7:30PM.Tue, 14 May at 7:30PM.Wed, 15 May at 7:30PM.Thu, 16 May at 7:30PM.Fri, 17 May at 7:30PM.Sat, 18 May at 7:30PM.Mon, 20 May at 7:30PM.Tue, 21 May at 7:30PM.Wed, 22 May at 7:30PM.Thu, 23 May at 7:30PM.Fri, 24 May at 7:30PM.Sat, 25 May at 7:30PM.Tue, 28 May at 7:30PM.Wed, 29 May at 7:30PM.Thu, 30 May at 7:30PM.Fri, 31 May at 7:30PM.Sat, 1 Jun at 7:30PM.Mon, 3 Jun at 7:30PM.Tue, 4 Jun at 7:30PM.Wed, 5 Jun at 7:30PM. Terms: Valid on all performances from 26 Apr - 15 May 2019. Book by 25 Apr.. Terms: Valid Mon-Fri from 26 Apr - 15 May 2019. Book by 25 Apr..
Man of La Mancha tickets: The tabs above allow you to select between links to suppliers and date searching. Click on a supplier's logo to see their details and on the 'buy now' button to see and check the tickets on offer.